Idle continues her series about a sister and brother and their dinosaur friends (Sea Rex, 2015, etc.) with a tongue-in-cheek manual on how to prepare for the Christmas holiday. The children, who are white, are entertaining guests: four dinos, including a gigantic, golden-brown T. Rex. The group works together to make decorations, bake cookies, hang stockings, and trim the tree. One dino destroys the fireplace trying to hang stockings, and when the T. Rex tries to add the star to the top of their tree, it knocks the tree over and crushes it. But in this cheery story, there are no grown-ups around to object to decorating disasters. 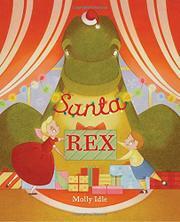 On Christmas morning, the children are surprised by a new sort of Christmas tree: T. Rex decorated with lights, paper chains, snowflake ornaments, and a pterosaur on top. This Christmas-morning surprise is given extra panache by a gatefold page that opens upward, adding height to the inventive dino-tree effect. The final double-page spread shows the children and dinos spending time together, enjoying “the real magic of the season.” Glowing illustrations in Prismacolor pencils use a vibrant palette of fruity hues with an overall ambiance of radiant light, and it is the visual counterpoint they lend to the deadpan text that gives the story its humor. The bright colors, flattened perspective, and old-fashioned clothing worn by the children lend a retro vibe.